Today’s technology advances at a fast rate. Attempting to adopt modern architectures can uncover a knowledge gap with developers, who might be unfamiliar with new architecture patterns and frameworks. This includes adopting cloud-native architectures to help with greater efficiency and cost benefits. 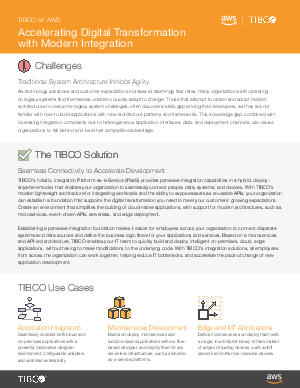 TIBCO’s integration solutions helps enable you to create an environment that simplifies the building of cloud-native applications, with support for modern architectures, such as microservices, event-driven APIs, serverless, and edge deployment.